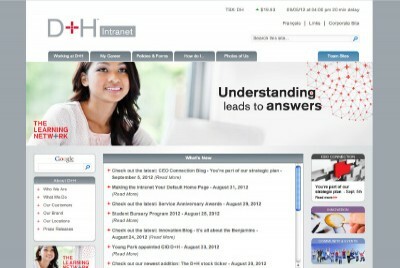 FinTech Company Employee Intranet :: INHOUSE Productions Ltd.
INHOUSE was tasked to build an employee Intranet on a Microsoft Sharepoint platform. Project consisted of developing the user interface, organizing blocks of information such as the news panel and CEO communication links as well as migrating existing content and building of an extensive library of D+H’s human resources documentation for allowing employees to access much of the company’s information from one central source. The client was using a Sharepoint platform to host internal documentation, primarily security and company policy documentation. The site used rudimentary navigation with stock Microsoft icons and did not incorporate any of the company’s branding and as such was primarily an off-the-shelf implementation. INHOUSE was tasked to review the existing content as well as develop a plan for providing specific areas for further departments within D+H to house various information and documentation.